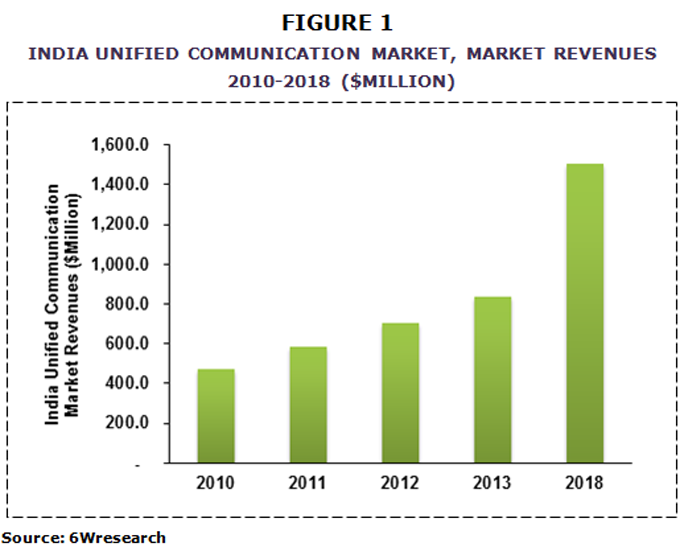 The India Unified Communication market is expected to reach $1,506.2 million by 2018, at a CAGR of 12.4% from 2013-2018. Increasing operational cost, growth of enterprise mobility, increasing internet penetration, etc., are some of the factors that are driving the market of unified communication in India. Traditionally controlled by voice based communication, the market is now evolving towards video conferencing. The report thoroughly covers the market by product types, by applications and by regions. The report provides an unbiased and detailed analysis of the on-going market trends and market segments. The report also gives the insights on key market drivers, restraints and trends that shape the present and future market. o Small Medium Scale Business. Communication has become the core building block of any organization. In the modern era, where business demand faster and cheaper way of communicating with clients, employees, partners, etc., unified communication has started picking its pace in the market. In Unified Communications (UC), various communication tools are collaborated with each other in order to manage all communications of businesses and individuals in one entity. By using unified communication one can create collaborative and adaptive work environment. It uses an intelligent, converged network as a platform for communications. Unified Communication integrates real-time communication services such as instant messaging, telephony (including IP telephony), video conferencing, etc., with non-real time communication such as email, voicemail, SMS and fax. By using unified communication one can easily increase the productivity and efficiency of a business. It also helps to reduce the decision times of a business. At present, majority of the India unified communication market revenues are generated primarily from large scale businesses, which accounted for 64.0% of the total market revenues in 2012. However, with the unified communication solutions providers coming out with solutions that are cheaper, the growth of UC in SMB market is expected to increase significantly. According to 6Wresearch, India Unified Communication market is expected to reach $1,506.2 million in 2018, at a CAGR of 12.4% from 2013-2018. The market for unified communication is gaining importance due to the increasing travelling cost, need to cut down turnaround time, increasing mobile workforce, growth of enterprise mobility and others.